Treasure Seeker’s, Tampa Bay History Center’s newest exhibit opens to the public. The History Center is located along Tampa’s Riverwalk and is generally walkable from all downtown hotels and accessible via the Pirate Water Taxi and the Downtowner. Is the pirate’s life for you? 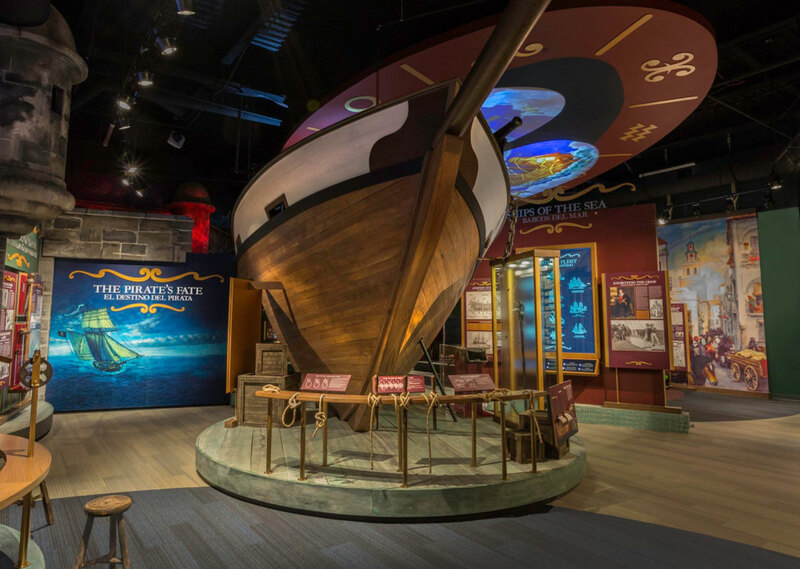 The permanent exhibition at the museum in Tampa, Florida, includes a 60-foot replica ship with pirate holograms; an immersive theater that shows what it was like to be at sea; and recovered sunken treasures. Artifacts include a 17th century ship’s bell and a rare astrolabe, an ancient navigation tool that determined latitude by measuring the angle of the sun and other celestial objects. Also featured: stories of real pirates like “Calico” Jack Rackham and female pirate Anne Bonny. Pirate history is popular in the Tampa Bay area, with the massive Gasparilla festival each January and the Buccaneers NFL team named for a type of Caribbean pirate. Galleries are closed on Thanksgiving and Christmas, and open until 3 p.m. on Christmas Eve and New Year’s Eve. The History Center is open daily from 10 a.m. until 5 p.m.